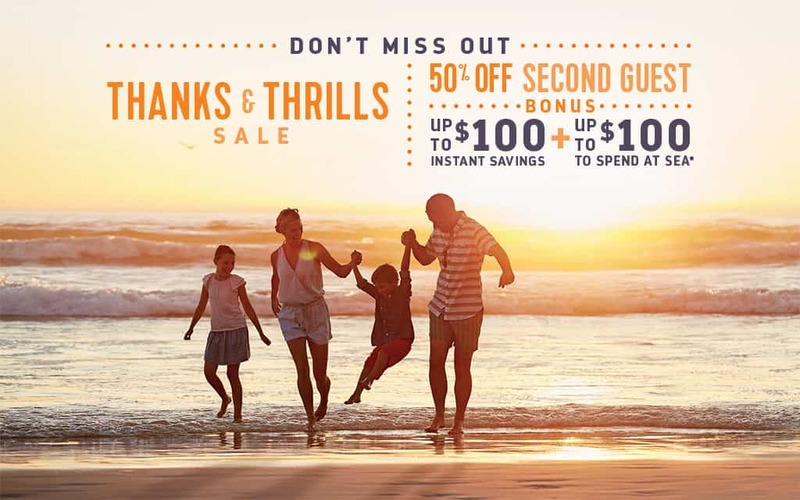 Royal Caribbean's Thanks & Thrills Sale starts today, which offers bonus instant savings. Guests can save up to $100 instantly when they book Royal Caribbean cruises between November 16 - 20, 2017 11:59 p.m. EST on sailings departing on or after December 16, 2017. Deck the Holidays and Thanks and Thrills offer exclude China departures. BOGO offer is combinable with NRDB OBC, promotional OBCs and instant savings, NextCruise offers, restricted discounts (for example, Senior, Resident, Military), Crown and Anchor discounts and Shareholder Benefits. Deck the Holidays and Thanks and Thrills are combinable with each other, NextCruise offers, NRDB OBC, and restricted discounts (for example, Senior, Resident, Military) but is not combinable with Shareholder benefits and Crown and Anchor discounts. BOGO50 bookings made for China departures are combinable with NextCruise offers and Crown and Anchor balcony/suites discounts only. All offers are not combinable with any other offer or promotion, including, but not limited to, Standard Group, Interline, Travel Agent, Travel Agent Friends and Family, Weekly Sales Events, Net Rates.